Ustad Jalal Chandio Sindhi Classical Music Singer. He was great legendary singer of Sindh. He was sung Sindhi Classical Sufi Music, Sindhi Lok Music, Sindhi Folk Music. He was first Artist of Sindh, a Sindhi Movie was made his name. He was sung a super hit songs in Sindhi, Saraiki and Urdu languages on his own style on "Yaktaro and Chapri". He was sung lot of Sindhi poets specially he sung "Hazrat Shah Abdul Latif Bhitai R.A", "Hazrat Sachal Sermast R.A" and others. He create great name in Sindh Music. I have selected most popular songs of Ustad Jalal Chandio as per demand of Sindhi peoples. He was one of the greatest Sindhi Artist who ruled the Sindhi Folk Music, Sindhi Classical Music and Sindhi Lok Music and influenced it more than anybody else could do. 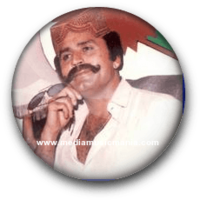 Ustad Jalal Chandio was a singer of love, he decorated Yaktaro and Chapriyoon "Castanets", he sang in the popular Sindhi rhythmic beats Kalwaro, Adho, Dedho and Ektal. We never forget this legendary Artist of Sindh. Legendary Singer of Sindh Ustad Jalal Chandio was born in Goth Misri Wah Phul, District: Noushero Feroze Sindh in 1944. Legendary Sindhi Artist created great name in Sindh Music. He sung songs in Sindhi and other Languages. He was son of a farmer and he became a singer after he falls in love. He was uneducated and he sung more than 10,000 songs in his career. Ustad Jalal Chandio was well known the singer of Yaktaro and Chapri and he opened School Yaktarepota School of singing. His great throaty voice, he could spellbind thousands of listeners, some even joined him and danced to the song. This great legendary Singer was died on 10th January 2001.